Ali Lawson is a resident athlete at the Goalball Center of Excellence at Turnstone in Fort Wayne. 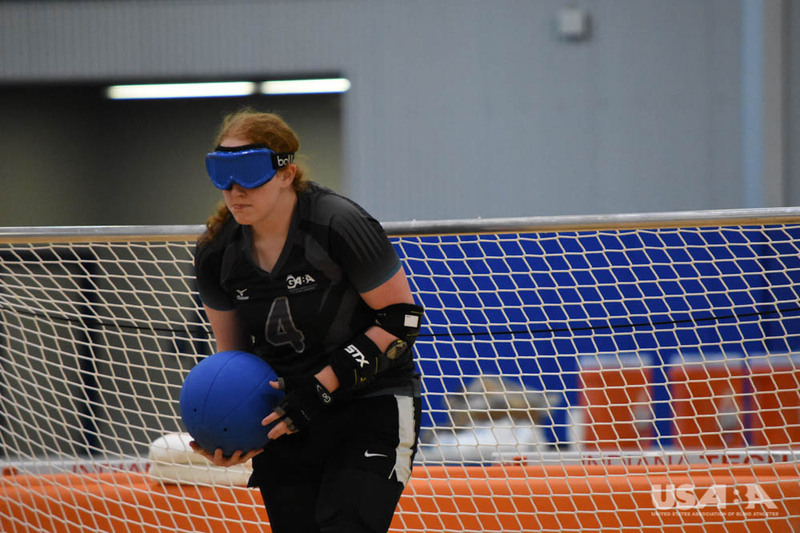 Lawson first learned about the sport of goalball when she was a sophomore in high school – at a summer camp with the Center for the Visually Impaired in Atlanta, Georgia. Since discovering and falling in love with the sport, she’s won 12 gold medals and three national titles (2014, 2017, 2018) at goalball tournaments across the country. We asked her to share what a typical day at the Goalball Center of Excellence is like for resident athletes. Check it out! We have a weekly routine of Mondays, Wednesdays and Fridays being scrimmage days and Tuesdays and Thursdays being longer days with drills and strength and conditioning. Here’s a typical Tuesday/Thursday schedule. 6:30 a.m. – I wake up with the rooster (figuratively speaking – we don’t really have a rooster) and eat breakfast. Depending on how awake I am determines what I eat. Sometimes it’s toast, yogurt, or just a granola bar. 7:30 a.m. – I change into my practice gear and start rolling out my muscles with a foam roller. I add on all my padding and walk over to the Goalball Center of Excellence court at Turnstone. It’s a quick 5-minute walk from our resident housing, which is directly across the street from the Plassman Athletic Center. 8:15 a.m. – At the gym, I’ll start my individual warm up and stretching routine. Once everyone is ready, Coach Jake has us do some team warm up drills. When everyone has worked up a good sweat, we work on all aspects of the game with different types of drills. Everyone has their own individual goals, but we work on them while working on team drills as a group. We all help each other out, whether it’s giving a word of advice or a kind word of encouragement, we grow together. Coach Jake has us do drills that work on different components of our offense and defense – accuracy, blocking, speed, movement, etc. 11:00 a.m. – We wrap up practice around 11:00 a.m. and head over to Parkview Medical Campus for lunch. I usually opt for a wrap or a flat bread. We eat at Parkview for lunch as a team every week day. They have a great cafeteria that offers a wide variety of options like pasta, sandwiches, grill items, a salad bar and more to refuel. After lunch, we head back to the houses (a short 10-minute drive) and get ready for afternoon practice. 2:00 p.m. – We work out with our strength and conditioning coach, EJ, for a couple of hours with the Men’s resident team. Today, it’s cardio circuits. There are 6 stations we rotate through – sled pushes, mountain climbers, medicine ball slams, walking planks, jump rope and tricep dips. We do each exercise for 30-60 seconds and three full circuits. Then, we finish up with ab work. Sometimes I add in some cardio on my own – usually 30 minutes on the bike or treadmill. 6:00 p.m. – We typically eat dinner together – whether we cook, go somewhere tor order take out. We have a full kitchen at the house and recently got a grill and a firepit for both the men’s and women’s houses to use. Everything we need to prepare food is provided in the kitchen – pots, pans, utensils, etc. When we cook, it’s usually pasta or something on the grill. 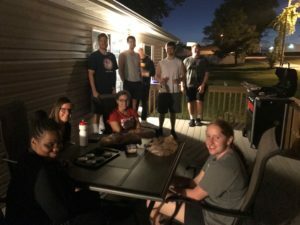 Ali and her teammates sit around a table on the deck outside one of the resident houses, enjoying a team cookout. 9:00 p.m. – I sometimes talk to my teammates or chat with my best friend back home. It’s tough being so far from my hometown (Atlanta, Ga.) but I’m grateful I can easily talk to family and friends at the end of each day. I want to know what’s going on back home and tell them about training here. 11:00 p.m. – My eyelids are getting pretty heavy by this point each night. Sleep is super important. It directly impacts my training if I don’t get enough. The body needs time to rest and recuperate so I’m sure to get to sleep by 11:00 each night. Learn more about the USA Goalball Resident Program.